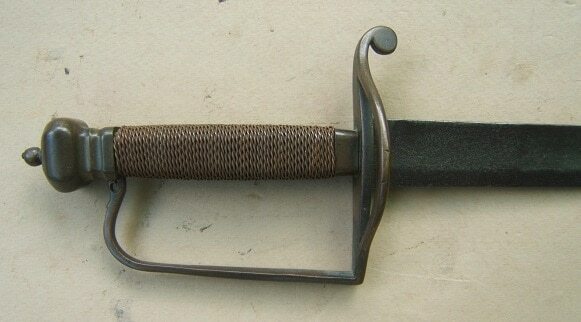 A VERY GOOD+ SCARCE AMERICAN REGIMENTALLY MARKED REVOLUTIONARY WAR PERIOD BAYONET w/ SIDE-MOUNTED RETAINING-SCREW, ca. 1770s: In overall very good+ untouched condition. American-made, tapered, triangular-form, 13″, flat blade of typical “English Brown Bess” fusil/carbine (.66 caliber) form: the base with a Circular maker’s mark. 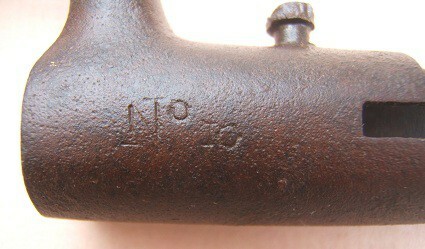 Closed ring, “Brown Bess” type, integral socket– for a top-mounted bayonet-lug. Of unusual American design with its side pierced for a tightening/retaining screw– for use on various Muskets. Also, marked on its side with a “No. 10” Regimental marking. In very good+ condition with some signs of use and untouched, deeply toned, steel surfaces with some scattered light discoloration, expected scattered pitting and a rich chocolate-brown patina with gunmetal highlights. Sharp contours and light signs of use/wear. 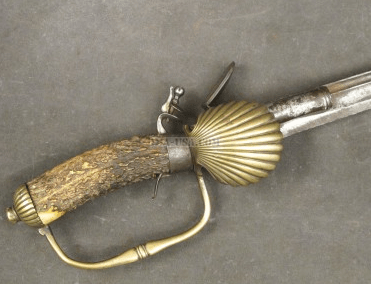 A very nice example of an American-made Revolutionary War Period Regimentally Marked Fusil/Carbine type Bayonet with an unusual side-mounted retaining-screw, ca. 1770s. Overall length, 17″. For a similar example, please see G. C. Neumann’s: “Battle Weapons…”, pg. 297.